Thousands of kids growing up in Pennsylvania have a skill that can be a great advantage when they hit the job market: they are bilingual. With the Hispanic population of the United States reaching 55 million people in 2014, including 38.4 million who grew up in Spanish-speaking homes, there is high demand across a wide spectrum of careers for employees who can act as interpreters and translators, and provide on-site expertise in Spanish language and culture. That was brought home to 25 teens from schools in Allentown, Lancaster, Norristown and Harrisburg last month when they attended a camp at East Stroudsburg University called Spanish at Work. Of those teens, 11 were bilingual while others planned to study Spanish in high school. The four-day camp was the brainchild of Jeff Ruth, Ph.D., professor and chair of modern languages at ESU, and two ESU alumni – Lorraine Angulo M’08 and Leo Teixeira ’03 M’05, both Spanish teachers who have taught classes at the university. The organizers sought to give the teens exposure to numerous careers where skills in English and Spanish are important. The students heard from bilingual medical professionals, restaurant owners, Peace Corps alumni, a lawyer and courthouse workers, educators and a United Nations interpreter, all of whom use Spanish and English in their work. The last day, the teens spoke with ESU staff and others about college and how to make it affordable. “Many of those kids have already worked as an interpreter or translator at some point with their parents or grandparents,” Teixeira said. Participants in the Spanish at Work camp had just completed eighth grade, and whether they were bilingual or being exposed to Spanish for the first time, they learned about the value of studying Spanish in high school and beyond. “For college students nationwide who have a double major, a language is by far the most common second major,” Ruth said. The teens stayed at Shawnee residence hall with chaperones from their schools and their days were packed with field trips and activities. At Pocono Medical Center, the students heard from medical professionals who use Spanish with immigrant patients and their families. 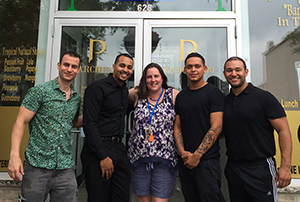 The campers had lunch at Parchè 570, a restaurant in East Stroudsburg where they ate authentic Colombian cuisine and spoke to the three restaurant owners who are all bilingual and ESU alumni — Steve Barrientos, Yony Liriano and Josue Vasquez. That day they also heard from Peace Corps alumna Letitia Lladoc, an adjunct professor at Northampton Community College in English as a Second Language and via Skype from Michelle Leip, who is working as a teacher trainer in the Peace Corps in Costa Rica. Also that day, the students went to the Monroe County Courthouse and met several bilingual employees and attorney Maria Candelaria, who told them how busy she is, thanks in part to her ability to speak both Spanish and English. One day they took an ESU bus to the United Nations in New York City and talked with a translator before visiting the Metropolitan Museum of Art. Each evening, the students and their chaperones watched inspirational movies, such as “Stand and Deliver” based on a true story of a Los Angeles math teacher who demands a lot of his largely Hispanic students. The students got a chance to use ESU facilities including the gym and computer lab as well as to swim, play games, have a pizza party and help cook a Spanish meal. The final day, the students heard from three bilingual ESU alumni — Deanna Repollet, business development manager for Major League Soccer Team Sporting Kansas City, Israel Marmolejos, principal at Great Meadows Middle School in Great Meadows, N.J. and Teixeira’s wife, Martha Vazquez Teixeira, an eighth grade Spanish teacher, all of whom told their own inspirational stories. The teens also spoke with Fernando Perez, Ed.D., associate professor and tutoring coordinator at ESU. The camp – which was free to the teens – was made possible by a $15,000 grant from the U.S. Department of Education through a program called GEAR UP, which stands for Gaining Early Awareness and Readiness for Undergraduate Programs. The program is aimed at encouraging at-risk students to set their sights on college and help them prepare. ESU provided $15,000 in matching funds. Margy Gallagher, who is a GEAR UP counselor with the Allentown School District and chaperoned six students from there, said the camp really showed the kids what an advantage it is to be bilingual and to pursue higher education. All the while, the organizers wove in lots of fun activities each day. Organizers Teixeira and Angulo could relate to the native Spanish speakers and non-native speakers because of their own backgrounds. Angulo grew up speaking only English but took Spanish in school and earned her master’s degree in Spanish from ESU in 2008. She has taught Spanish at Pocono Mountain School District and works periodically as an adjunct professor at ESU. Teixeira, who teaches Spanish at Hackettstown High School, grew up in Brazil speaking Portuguese, and learned Spanish after arriving in the United States at age 23. He received his bachelor’s degree in biology and marine science from ESU before getting his master’s in instructional technology with a focus on a second language. Teixeira, Angulo and Ruth hope to repeat the program next year. Gallagher said the organizers should be encouraged by the rave reviews she heard from her Allentown students.